MAAG MERCURE AG offers this revolutionary, fully automated package cutting machine exclusively in Switzerland. It offers a perfectly adapted packaging in a simple new way. A real revolution in the packaging industry, furthermore you save money and protect the environment. Perfectly fitted packaging in a convenient new way. Autofocus: the machine automatically adapts to every kind of cardboard. No input needed. 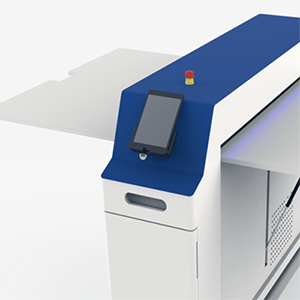 Automatic measuring of material dimensions: the machine measures the height, width, length and thickness of your material. Automatic folding of tables: if there’s too much pressure on the table of the machine, it will automatically bend to prevent the machine from tipping over. Can be lifted with a hand pallet truck: the machine is easy to transport. Choose from a large number of boxes (including Fefco-standards) from the Slimbox app. Or create your own box by entering the dimensions. Experiment with your package design. Upload a personal drawing and cut it into whatever shape you want. 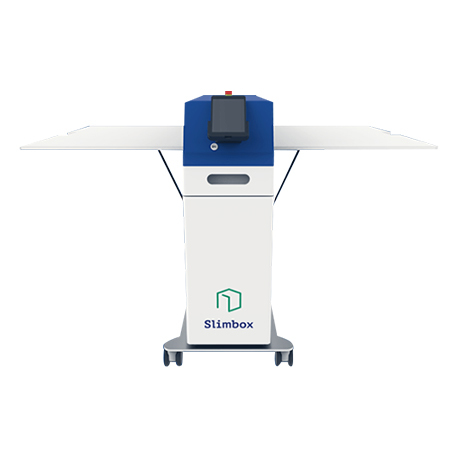 Control the machine entirely with the Slimbox app. Your mobile device can connect over USB or wireless (even with no network available). Packing heavy goods? Just push one button in the app and cut a new box that perfectly fits around your last box. Do this again until it has the strength to hold your product. The unique structure of corrugated cardboard makes for incredible strength and long durability. Corrugated cardboard is in nature environmentally friendly. It exists of three or more papers that are mostly made out of recycled paper and cardboard.